Behind meter-thick rubble stone masonry can feel protected and secure safe at home. Mighty oak beams pile up in the air and give the dry stone masonry the necessary hold. The massive timbered building was built 1525 and was originally the retention of compulsory levies, which the peasants had to pay the resident in the castle rule. This tax was called tithe and has given its name to the barn. Twenty years ago, were still cows. Today, lovingly restored, the tithe barn is something of a train station for a trip into the past. You can enjoy local food and homemade specialties. 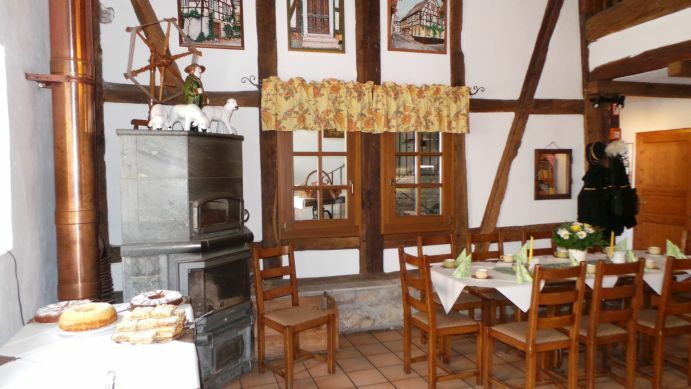 The cafe is nestled in the old city walls and Herrstein has much to offer travelers, hikers, families and clubs to rest and relaxation. As the Tithe Barn fared in the seventies about 50 half-timbered houses in the old center. The dull gray plaster and fiber cement boards, under which they wanted to coyly hide the rural past was scrutinized. Come to the fore highlights of the late Gothic, Renaissance and Baroque. Today, Herrstein is a model of heritage conservation. It carries the pride of Europe Diploma nostra an international association for the protection of cultural heritage together with Heidelberg, Lübeck and Rothenburg.